The experience of wine tasting in Napa and Sonoma has shifted dramatically in recent years (read more about wine country changes here). A likely result: Wine Country has never been more accessible to children and families. This is a boon to my family of four as for years, wine country has been, at worst, off-limits, and at best, rather unwelcoming to families with young children. 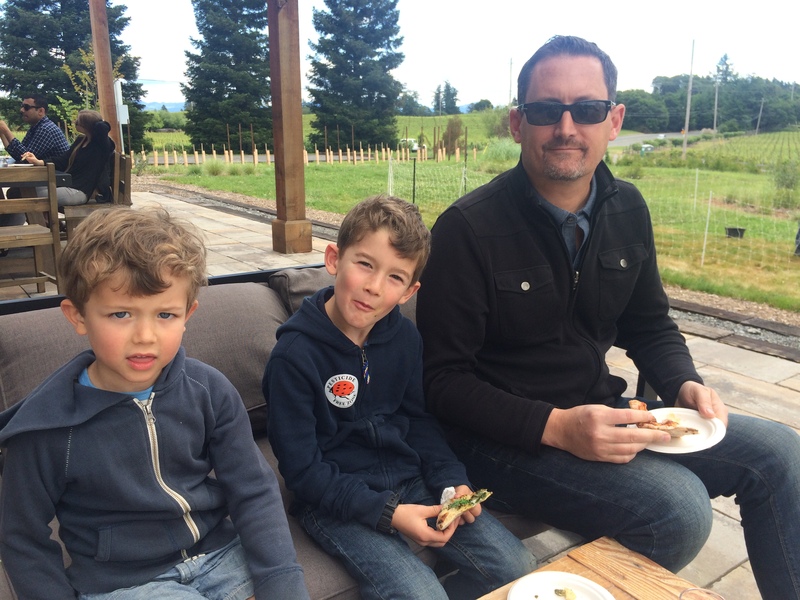 Below are just a few vineyards that offer wine-focused events that do not exclude the family. Father Gordon Kalil of the Saint Helena Catholic Church (with Violet Grgich) blesses the grapes with fresh vines. 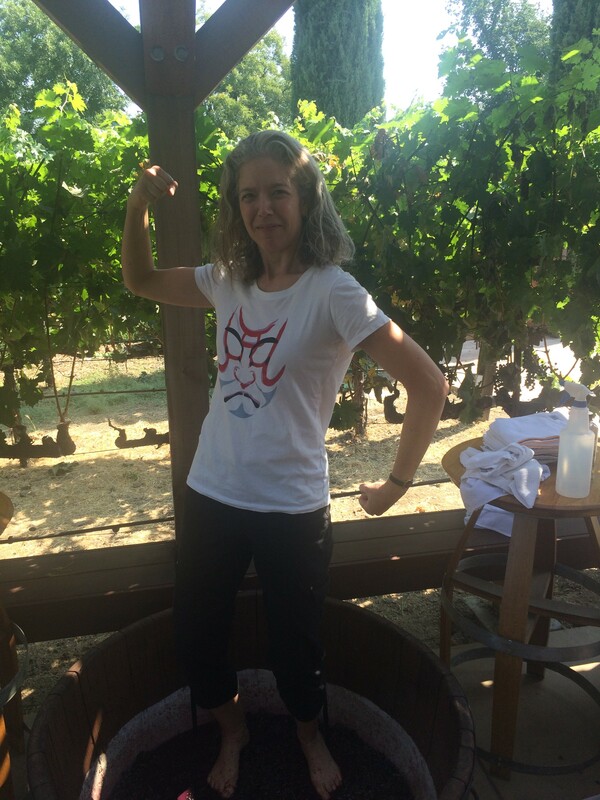 At Grgich Hills Estate, the annual Blessing of the Grapes and Grape Stomp packed a one-two punch. 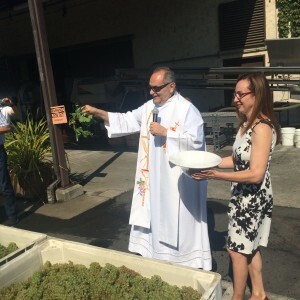 Adults were handed a glass of chardonnay as they walked in before being treated to a ceremonial blessing of the grapes by Father Gordon Kalil of the Saint Helena Catholic Church. Father Kalil blessed the grapes with words, then dipped fresh-cut grape vines into a bowl of water to bathe the grapes with the blessing. The crowd was “bathed,” too, much to my kids’ delight. Lukas and Niki did not need any encouragement to belt out “You are my Sunshine” and “Que Sera Sera,” another Grgich family harvest tradition, one accompanied by accordion and bass. Blessings finished, we sauntered over to the outdoor patio to enjoy a light bite, more wine and some amplified music before heading under a trellis to get our feet wet a la “I Love Lucy” (without the wrestling) inside a wine barrel. Squishing grapes between your toes, like much of the rest of this day at Grgich, is a time-honored tradition. The soft grapes pop and slide under and between your toes, adding a unique, personal touch to the harvest. You might even call it a blessing. COST: $35 per person for group visits (8+ people) / $30 per person / $20 for Club Members / $15 for under 21, per person; reservations required for groups of eight or more. 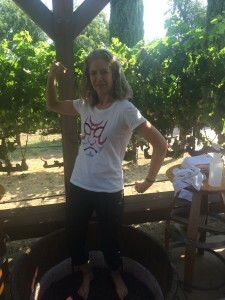 WHEN: Grape Stomp: August 19 – October 31, 2016, 10 a.m. to 4 p.m.
INFO: For reservations, email info@grgich.com or reserve online at https://www.grgich.com/visit-us/tours-tastings/. Everyone has more fun at a party when the kids are able to enjoy themselves. 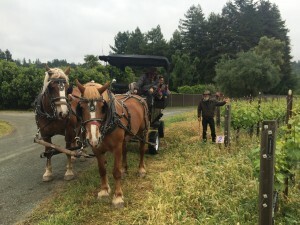 Knowing this, Landmark Vineyards hosts a series of family-friendly events throughout the year (look here for the schedule) but it is the regularly scheduled horse-drawn carriage tours on the weekend that make a visit worthwhile. 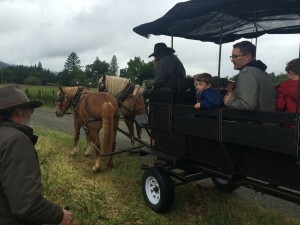 The recent Oyster, Bocce and Wine Festival launched our day in Sonoma Valley. The adults slurped down a few bivalves with Landmark Pinot Noir and Chardonnay while the kids preferred the cornbread, baked beans and slaw. Sated, we spent some time dancing along with the band before heading out to meet the two Belgian draft horses and hopping on the covered wagon for a tour around the vineyard. Lukas and Niki are still talking about the experience. INFO: Carriage rides are available every Saturday and Sunday from early May until early October, between 12 and 3 p.m. For reservations, email concierge@landmarkwine.com or call 707-833-0053. Look here for more information. Pizza is the ultimate kid-friendly food and Emeritus served it up wood-fire hot and in veggie and meaty options at their annual End of Frost party, one of many winecentric events that perfectly showcase their comfy new Tasting Room. 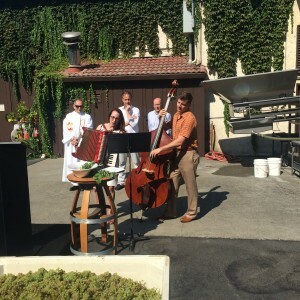 Live music juiced up the scene but it was the barrel samples, new releases and winemaker Brice Jones’s special Ruby Ruby rose tasting and bottles for purchase that brought in the adults. A miniature petting zoo, featuring baby goats and sheep from a nearby ranch reminded kids and adults of the deep agricultural roots the region is known for and kept the little ones busy under the trees. COST: Event costs vary; reservations are recommended but only required for groups for six or more. INFO: The Tasting Room is open daily, between 10 a.m. and 3:30 p.m. For reservations, email inquiry@emeritusvineyards.com or phone 707-823-9463. Look here for more information.